Teflon ® Advanced Carpet Protector. Superior Repellency. So Easy To Apply. Once your carpet or upholstery is clean, you will want to protect it. The popularity of DuPont’s Teflon ® is largely due to the stain resistant qualities it has. Most people enjoy the confidence of knowing that if they spill something, it can easily be dabbed off of carpet or material with a damp sponge or cloth. DuPont Teflon ® carpet protectant gives you the added assurance that your carpets will be professionally maintained and the possibility of permanent stains drastically reduced. Teflon ® can also add life to your furniture and carpets as well. By sealing the fibers, it can make vacuuming more effective. When soil and dirt are introduced to your carpet and furniture materials, they act as an abrasive. Soil will actually wear the fibers as you walk and move on them. Teflon ® prevents the soil from becoming lodged, or entangled, in the fibers themselves, and makes it easier to vacuum soil particles away. Aside from the abrasive nature of soil, a certain degree of color transfer occurs. Much like having a fender bender  in your car and having paint transfer colors from one vehicle to the next. Soil will transfer its color to the fibers of your carpet and furniture. This is why heavy traffic areas seem to have a darker color to them. Even though soil can be removed, it may have already transferred color to the fibers. Protect your carpets and furniture from Old Age  by putting a barrier between the fibers and the dirt. Teflon ® Advanced is applied by spray application, dries quickly, and leaves no odor. It is non-toxic and safe to use around family and pets. It “s CFC- and solvent-free. DuPont recommends the application of Teflon ® Advanced after each cleaning on all carpet fiber types. Always ask for Teflon ®. Unfortunately there is probably as much confusion in the carpet cleaning industry about carpet protectors as there is about cleaning. Uneducated, uninformed, and sometimes downright unscrupulous carpet cleaners cause a great deal of confusion by giving out false information or intentionally misrepresenting the product. A nylon stain-resist carpet is made with two protective properties: The first is an acid dye blocker that is basically a clear dye that fills the extra dye sites in a fiber. This helps to keep “foreign” dyes (such as red dye in a beverage) from penetrating the carpet fiber. The second property is called a “fluorochemical”. It is commonly known as 3M Scotchgard ® or DuPont Teflon ®. This treatment helps keep spillage from actually getting to the acid dye blocker, but its biggest job is to resist dry soil. By resisting dry soil, less soil bonds to the carpet, therefore being picked up by your vacuum or cleaning. Making sure that you have a sufficient amount of protector on your carpet will help keep the soil from bonding to the carpet. Once it bonds to the carpet, it acts like sandpaper on your traffic area. Once the traffic area yarns are broken down, there is no way to bring them back to their original state. 1. Regular foot traffic. Over a period of 6 months to 2 years depending on the traffic, a significant amount of protector can be removed from your traffic areas and needs to be reapplied. 2. High alkaline cleaner. Uneducated, uninformed, and sometimes downright unscrupulous carpet cleaners use harsh chemicals on the carpet that will strip it “s protection. If one of these rascals has been in your house, you may want to have the carpet re-protected. 1. Not using high quality protector. Discount protectors are not as effective and sometimes void the warranty of the carpet. Our Company uses only the highest quality, recommended protectors. 3. Not applying the product properly. Some cleaners either under apply or over apply the protector. Under applying it doesn “t allow for complete penetration on the carpet yarns. Over applying it causes the carpet to become overly stiff and crusty. 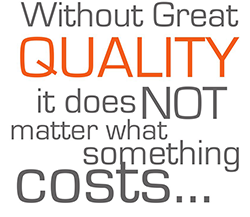 Our Company technicians are diligently trained for proper application. A great looking carpet can be ruined by an ugly spot. 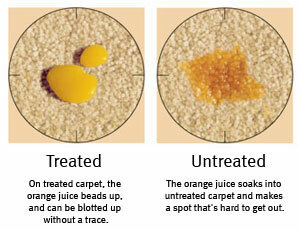 Unprotected carpet doesn “t repel spillage as well as protected carpet. Being able to remove spots and spills more effectively, you can avoid permanent staining. Although you want to call us out to handle any spot you cannot remove immediately, carpet protector helps you remove more spots than you could without protector. You may be able to save a minimum charge by removing the spot yourself. is that your carpet will look better and last longer.